Dramatic, show-stopping performances in Las Vegas, Gladstone and Devon have the name “Courtney King-Dye” being mentioned on the same sentence with “Beijing,” site of the 2008 summer Olympic games. And while Courtney has been a successful dressage rider for years, she seems to be really getting noticed now. Consistently performing at this level requires a lot of hard work, as Courtney will attest. In fact, overcoming the odds, the competition and the challenges along the way requires a team effort. For the most part, Courtney’s Grand Prix stallion Idocus has been up to the challenge. But for one moment in early 2007, there were questions. “Shortly before the World Cup time trials in Del Mar, Idy simply wasn’t himself,” Courtney explains. Leading up to the World Cup, Courtney and Idocus spent a few weeks at the barn of former Olympian Steffen Peters and his wife Shannon, both top dressage riders and trainers. Observing Courtney’s issues with Idocus, the Peters sang the praises of SUCCEED® Digestive Conditioning Program®. The difference? All the difference in the world. 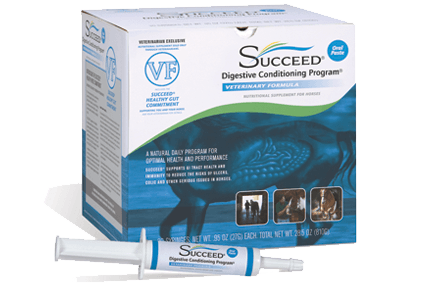 Courtney discovered that horses’ digestive tracts maintain a delicate balance that can easily be altered by the challenges of modern performance horse care. Too many products address individual problems, after they occur. 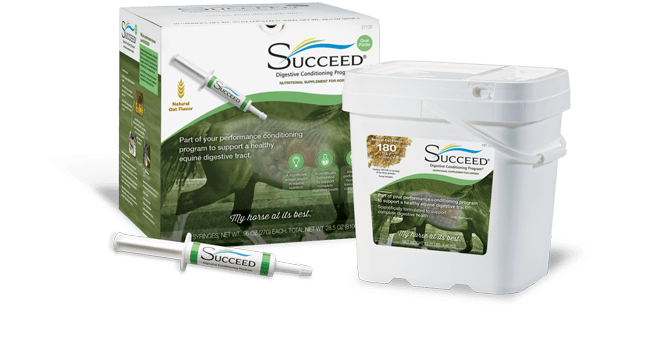 SUCCEED is a unique, daily nutrient program that maintains a healthy digestive system. And as Courtney knows from her own experience, that can directly affect the horse’s appearance, temperament and performance.